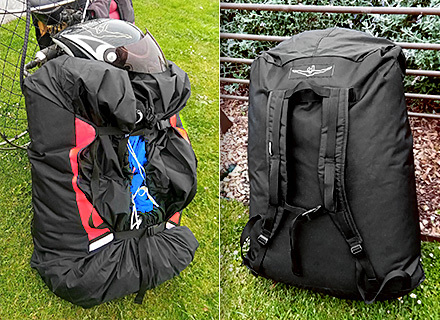 The Mono-Pack is a quick pack bag that transforms itself in a very comfortable rucksack for motor wings pilots and free flight pilots. Just place the canopy inside the bag and pull the rope and adjust the compression straps. This is great for carrying the wing and your gear up the mountain or to keep the wing inside the car without damaging the fabric or the rods. It has two big handles to carry it with your hands or you can use the shoulder straps to carry it in our bag. The final volume is quite small therefore it is as comfortable as the best trekking rucksack without the need of packing away the wing. All motor wings are delivered with this wing. If you want your free flight wing with the Mono Bag please specify it when making your order. As a reminder there Windtech has also available the Quick Pack Bag. With 50% more space this is ideal for tandem wings.